The feature is meant as a feature to use so that you aren’t distracted by looking at your phone while driving. You can configure this feature as well as enable or disable it using the following steps. Open the Verizon “Messages+” app. Select the “Menu” button located at the upper-left corner of the screen. Driving Mode is enabled when paired with an audio device via Bluetooth. Tap “Add device” to use Driving Mode with the chosen device. Uncheck any that are checked if you wish to disabled it. 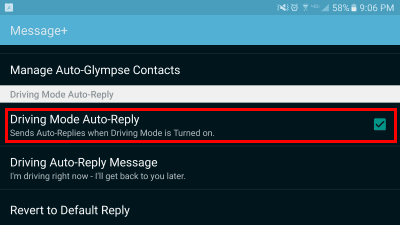 Check the “Driving Mode Auto-Reply” to enable it, uncheck it to disable it. When enabled you can select “Driving Auto-Reply Message” to set the auto reply message you desire. What happened to the Samsung Driving Mode feature that was on prior Galaxy S phones? How do I turn off Driving Mode PERMANENTLY on my Samsung Galaxy 9? Verizon Galaxy S10 now has driving mode and will not allow text messages to go to bluetooth devices while driving, even when you have it turned off. When my s7 edge is paired with my 2015 Silverado, the voice feature on google maps stops working so in effect, I have to keep looking down at my phone to visually confirm the directions instead of just hearing them. Is there a way to correct this? No. Whether I”m driving or not, this blocks ALL MY CALLS. How do I turn this feature off PERMANENTLY? so if you disable devices to keep driving mode frpm coming on, how do you use you devices, I drive truck and am required by law to be hands free or pay $3000.00 fine if caught ?? I figured it out. In the message app there is a setting to associate any configured WiFi device that has ever been paired to your phone. You can delete everything except for the car. When the car is turned off, you can get as close to it as you want. I went messages. settings. turned off driving mode. turned off my vehicle selections. left only fit bit and my tablet. THE STUPID DRIVE MODE STILL RADOMLY TURNS ON!!!!! Is it possible to delete the drive mode like you can regular apps. My driving mode will not shut off. It worked fine until today. I “disabled” driving mode. It keeps turning itself back on if I get anywhere near my truck. Is there any way to make this feature controllable? It has made my phone almost unusable! Quick fix with this answer! All I had to do was disable each device that connects to my phone. Thanks for a clear answer. I need to know how to turn off permanently unless I want it on I have bluetooth enabled on my phone for my Fitbit but drive mode comes on while I’m sitting in my house. I accidentally enabled driving mode when I added a bluetooth device to my Galaxy S7. It kept coming on while I was going about my day. It was making me crazy for 2 days. This process solved my problem. How do you PERMANENTLY turn off this feature unless I want it back on? Turning it off will only last until I get in my car and start driving again. I don’t always remember to turn it off when I get in the car, and as stated before, I definitely don’t want it on while I’m a passenger! ever since I have paired my fitbit Blaze with the S7, it automatically goes into “driving mode” I want to make it stop!!! It turns on automatically and won’t stay off. Fix this bug! 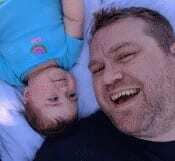 I turned on the driving mode by mistake, and could not figure how to disable it. This article was very helpfull. Thank you for your help. This was driving me crazy. I don’t use my phone while I drive but I also want to hear that someone has called me when I’m a passenger. So thank you for your help!